A well-designed commercial kitchen is integral to efficient, safe and profitable food preparation. A commercial kitchen designed to consider ergonomics will be appreciated by the owner, chef and kitchen workers. The fewer steps required to complete a task, the better. Careful, considered planning in the design of the kitchen will save money and time during the construction phase and increase profitability over the life of the kitchen. 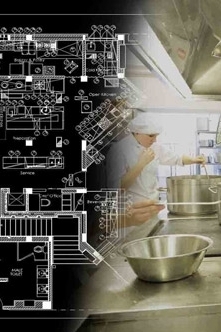 Commercial kitchen design plans are dictated by space requirements, equipment and budget. Intra Steel provides customers with professional food service consulting and kitchen design services. Reducing utility costs and designing for employee efficiencies are especially important for institutional clients. We are well versed in the needs of the institutional operation. We provide our clients with a complete package for all food service facilities from the largest hotel and convention facilities to the smallest coffee shop or fast food restaurant.